Tel Aviv, Israel and Woodbury, New York. October 9, 2018 – Research Frontiers Inc. (Nasdaq: REFR) and Israel-based material science company Gauzy Ltd. announced today that Gauzy will be producing SPD-Smart light control film for the entire SPD-SmartGlass industry. 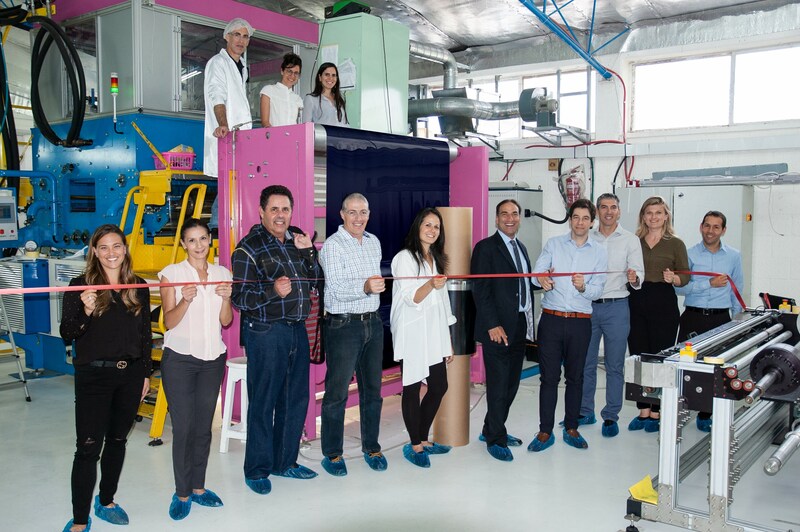 The announcement came at a ceremony to celebrate the inauguration of Gauzy’s production line to produce SPD-Smart light control film in Tel Aviv-Jaffo where, along with Gauzy’s 65 employees, Gauzy CEO Eyal Peso and Research Frontiers CEO Joseph Harary, cut the ribbon on the new factory. while select members of Gauzy’s senior management and board of directors look on. Gauzy’s film production line has a capacity to produce up to 364 thousand square meters of film per year per shift. While current SPD-Smart film is being produced for the smart glass industry in rolls that are one meter wide, Gauzy’s initial production of SPD-Smart film later this year will be 1.2 meters wide, and next year they will be producing SPD film that is 1.5 meters wide. Gauzy will thereafter be able to produce SPD-Smart film that is the same 1.8 meter width that Gauzy currently produces for its PDLC film. By meeting these and other milestones, Gauzy has the ability to be one of only two manufacturers in full production of SPD-Smart film that is licensed by Research Frontiers to supply the entire SPD-SmartGlass industry for all markets, including automotive, aircraft, marine, museum and architectural. Note: From time to time Research Frontiers may issue forward-looking statements which involve risks and uncertainties. This press release contains forward-looking statements. Actual results, especially those reliant on activities by third parties, could differ and are not guaranteed. Any forward-looking statements should be considered accordingly. “SPD-Smart” and “SPD-SmartGlass” are trademarks of Research Frontiers Inc.